uuid : be41628a-3cd1-41ce-8a54-3a64f4286c09 templates_id: 119541 templates_uuid: "60af150d-177f-4a9a-96e6-616ffcc6d944" title: "Poor Performance Hearing Letter - Invitation to Poor Performance Hearing" display_name: "Invitation letter to a poor performance hearing" meta_keywords: "Poor performance hearing notification " description: "
Make sure you do things right when you invite an employee to a poor performance hearing, with this invitation letter to a poor performance hearing. This notice of poor performance hearing sets out in clear and simple terms the process to be followed and the employee\302\222s rights, helping ensure that the employer complies with the laws on performance evaluation. Poor performance is where an employee is not meeting an employer\302\222s expectations. Examples of performance issues include: poor customer service, failing to meet work targets, missing work deadlines, inadequate quantity of work, inaccurate work, wasting work materials, failure/refusal to follow instructions, and/or unwillingness to take responsibility. How is poor performance different to gross misconduct? Gross misconduct relates to actions or behaviours of the employee that is so serious that it undermines the mutual trust and confidence between the employee and their employer. Gross misconduct will usually result in instant or summary dismissal. Examples of gross misconduct: theft and dishonesty, vandalism of employer property, fighting or physical violence, accepting or offering bribes, indecent behaviour, fraud etc. What is a poor performance hearing? A poor performance hearing is a type of disciplinary hearing. the employee\302\222s right to be accompanied (by a colleague or trade union representative) at the hearing. This is a statutory requirement.
" created_timestamp: "2018-10-08 04:36:46.0" modified_timestamp: "2018-10-08 04:36:46.0" active: true created_by: 236 modified_by: 236 dcm_id: 257 url_slug: "Letter-inviting-an-employee-to-a-poor-performance-hearing" meta_description: "Create an invitation letter to a poor performance hearing with simple guidance from Rocket Lawyer. Make sure you do things right when you invite an employee to a poor performance hearing. Try this notice of poor performance hearing for free." time_to_complete: "10 minutes" role1: "Employer" role2: "Employee"
Make sure you do things right when you invite an employee to a poor performance hearing, with this invitation letter to a poor performance hearing. This notice of poor performance hearing sets out in clear and simple terms the process to be followed and the employees rights, helping ensure that the employer complies with the laws on performance evaluation. Poor performance is where an employee is not meeting an employers expectations. Examples of performance issues include: poor customer service, failing to meet work targets, missing work deadlines, inadequate quantity of work, inaccurate work, wasting work materials, failure/refusal to follow instructions, and/or unwillingness to take responsibility. 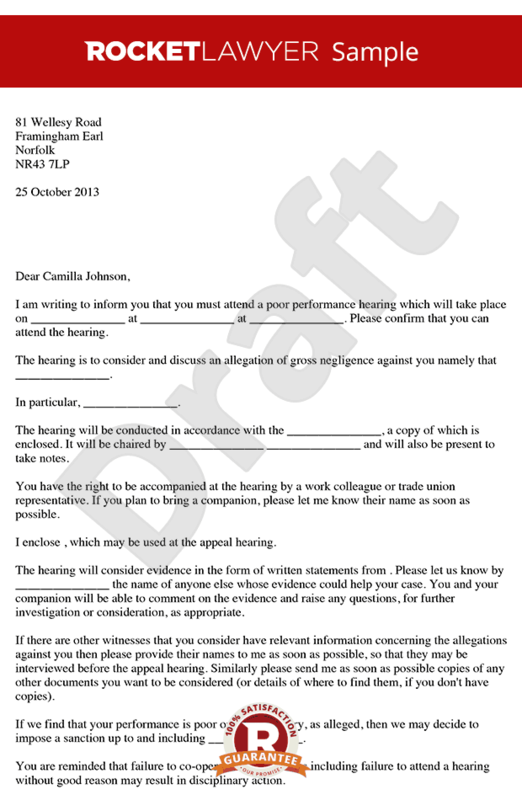 the employees right to be accompanied (by a colleague or trade union representative) at the hearing. This is a statutory requirement. More than just a Invitation letter to a poor performance hearing template, our step-by-step interview and guidance makes it easy to create your document. Easily create online, download, print and sign your free Invitation letter to a poor performance hearing in minutes. This document is also sometimes called: Poor performance hearing notification .